In today’s world, it is growing increasingly difficult to achieve a stable work-life balance. Working in the administrative profession, you are faced with numerous challenges and stressful situations daily. These high pressure situations can cause us to go onto ‘auto-pilot’ in our personal lives and focus all our energy on our work. Despite constant work pressures, your career shouldn’t be your only priority. Your life should! In fact, you’re more likely to succeed professionally, if you make the time and effort for your private life as well! 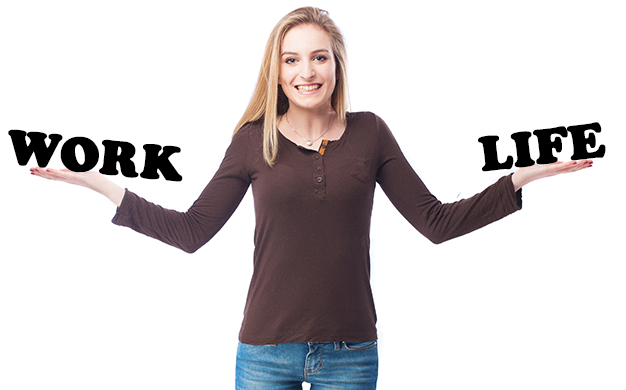 Having a stable work-life balance will make you a lot more energetic and happier in both environments. A positive attitude will help you cope with any pressures you face. A positive and enthusiastic approach will lift you out of any negative situation and keep you focused on what needs to be done without feeling overwhelmed. It’s normal to strive for perfection, but it’s not always something that we can achieve. On the other hand, striving to do your best is something you can control. As long as you put in your best efforts with the time and resources at your disposal, that’s the main priority. Unfortunately, you won’t achieve every goal first time, but it’s important that you don’t let any failures consume you. Use it as learning experience. Remember, it’s okay not to be perfect. You are human after all. Don’t let your fears control what you do and the time spent on it. This extended time will often take over other, more important things, which will throw out the balance you are trying to achieve. Confronting your fears and facing your challenges, will make you more proactive in your approach to achieve your work-life balance. Since your job can easily overshadow your private life, it’s important to ‘unplug’ over the weekends and holidays and make time for your friends, family and YOU. You need to switch “work-mode” off when you aren’t at work. Going through work emails or checking on work when you should be relaxing will just chew into your private life. Start small by removing email notifications for just an afternoon and see how much extra time you have for your family and more importantly, for YOU. To achieve a work-life balance, we need to learn how to manage our work life so that it doesn’t consume us. By setting normal working hours and sticking to them, we give ourselves a time limit as to when things can and should be done. This will give you the opportunity to still have time for your private life. Just remember to ‘switch off’ after your working hours and ignore the need to constantly check on work. We have all heard the saying “A healthy body equals a healthy mind”. Part of your life balance is to spend some time on yourself! Make the time to do a physical activity, even if it’s just going for a walk or doing a weekly parkrun. This will give you some time for yourself or to spend it with friends or family. It is also a healthy way to relieve any built-up stress. When you’ve got a lot on your plate, it’s very easy to feel overwhelmed and forget everything that you wanted to do. To prevent this from happening, make a list of all the things that you need to do and then put them in the order of importance and their due date. This is a very simple method to prepare yourself and keep track of everything that you need to get through. Each of your tasks will receive the necessary attention and you will also have more time available. Your stress levels will probably be a lot lower too if you have a structured plan in place. Putting all your time and energy into only your job will exhaust you and you’ll neglect what’s going on around you. Too much of anything is never a good thing so you need to strike a balance. Achieving a work-life balance is not an easy process, but it’s definitely not impossible. You just need to keep working at it! Each one of these 7 methods will help you to become better organised and make the time for your private life so that you can find the right balance and enjoy your life. If you want to learn more about your work-life balance then register for our 16th annual Professional Administrators and Secretaries Conference South Africa (PACSA) taking place at Sun City on 22-24 August 2018. This topic will be included along with many other amazing ones at South Africa’s premier secretaries and administrators event.